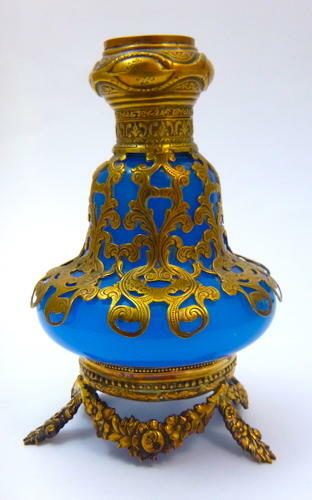 Antique French Blue Opaline Scent Bottle. Palais Royal 19th Century Blue Opaline Glass Perfume Bottle with Miniature of Sacre Coeur Paris. This Beautiful Perfume Bottle Sits on a Dore Bronze Base and Three Feet in the the Shape of Garlands and Swags. Unusual Shape and Fine Dore Bronze Mounts.